Over 100 alumni and friends joined Thomas J. Minar, PhD, vice president of development and alumni relations, to celebrate the official launch of the AU Entertainment and Media Alumni Alliance (EMAA) at the W Hollywood in Los Angeles on June 19. The event – hosted by Preeti Shrivastava, SOC/BA ’02 – featured a cocktail reception, lively networking, and special remarks by Dr. Minar and Caty Borum Chattoo, executive-in-residence at the School of Communication. EMAA Host Committee member Danielle Gelber, SIS/MA ’82, executive vice president, Wolf Films and executive producer, Chicago Fire, ended the featured presentation with her personal story and sharing why she stays involved with AU. Q: What was your motivation to volunteer as host [for the EMAA Launch Party]? Preeti: The fantastic School of Communication at American provided me with so many amazing opportunities while I was still just another student with big Hollywood dreams. I’m so grateful for the faculty, alumni, and even fellow students who helped guide me on my way out here. Q: Were there key takeaways from the event for you personally? Q: Were there any remarks that stood out for you? Preeti: I loved Danielle Gelber’s anecdote about how she started as a temp at Aaron Spelling Productions and worked her way up to where she is now. It really was a great story that showed even a small job in Hollywood can be turned into something spectacular if you have determination, perseverance, and really make it your own. Danielle wasn’t satisfied with just being a temp. She was going to be the best temp they ever had… and, of course, people noticed. We asked Preeti how she would describe the event in one word. She said, “Amazing.” We agree. View event photos on the AU Alumni Association’s Flickr page. 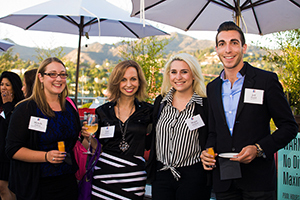 Stay tuned for more Entertainment and Media Alumni Alliance events and alumni engagement opportunities in L.A., New York, and D.C., and be sure to join our social media groups on LinkedIn and Facebook to stay close to the buzz.